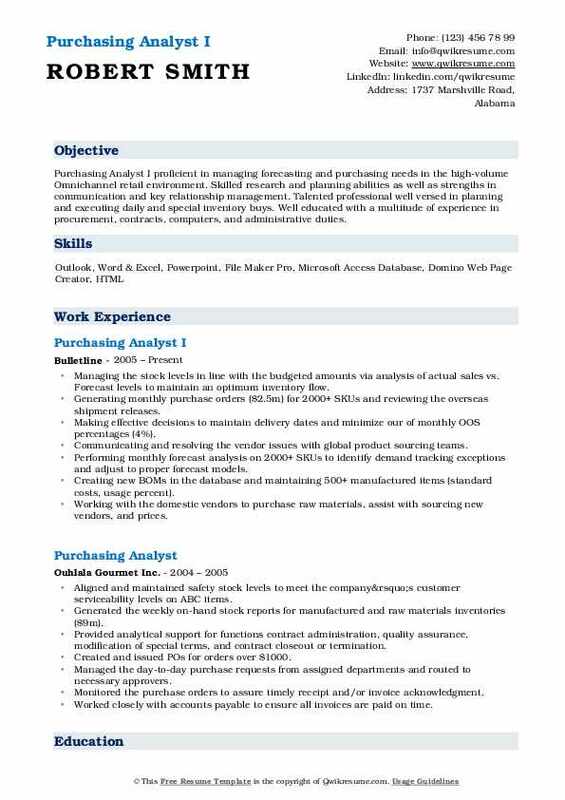 Purchasing Analyst analyzes the organization’s purchasing activities and evaluates its effectiveness. 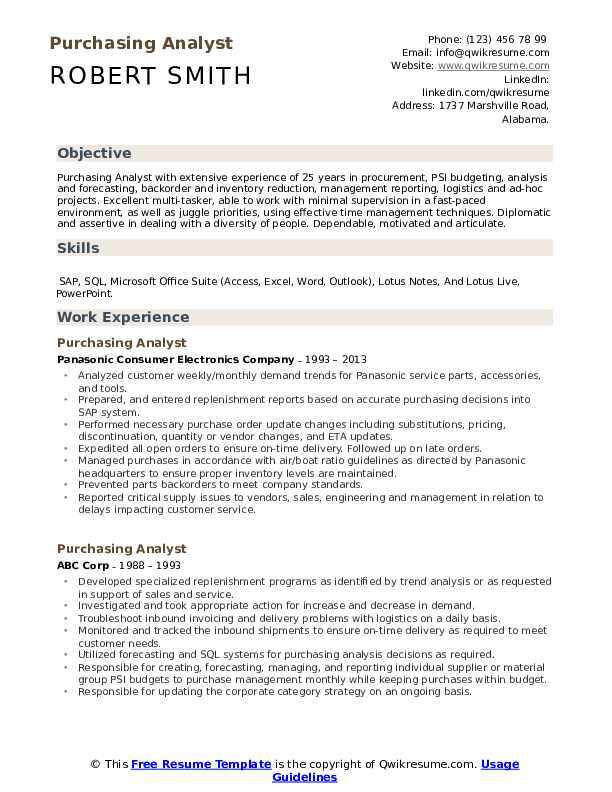 The most common duties stated in the Purchasing Analyst Resume include – planning purchases, interpreting financial data for the company’s purchasing endeavors, evaluating procurement needs, supporting management in evaluating supplier proposals, cost, quality; reducing costs, overseeing purchasing performances, developing purchasing reports, recommending changes in acquisition processes, increasing company profitability and writing orders and reviews for bid proposals. Procurement expertise, negotiation skills, knowledge of MRP demand planning, e-procurement processes and familiarity in contract negotiation, purchasing data analysis and Microsoft packages are commonly seen in the resumes for this job post. Candidates seeking a career in this line are also expected to possess advanced problem-solving skills and anticipate purchasing issues. A Bachelor’s degree in Economics, Finance or the related field is considered to be the minimum educational qualification for this job post. 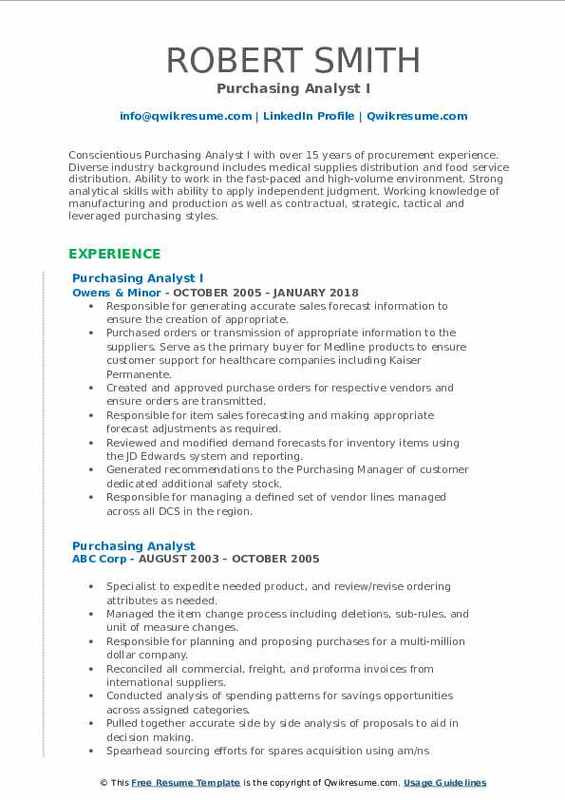 Summary : Purchasing Analyst with extensive experience of 25 years in procurement, PSI budgeting, analysis and forecasting, backorder and inventory reduction, management reporting, logistics and ad-hoc projects. Excellent multi-tasker, able to work with minimal supervision in a fast-paced environment, as well as juggle priorities, using effective time management techniques. Diplomatic and assertive in dealing with a diversity of people. Dependable, motivated and articulate. Skills : SAP, SQL, Microsoft Office Suite (Access, Excel, Word, Outlook), Lotus Notes, And Lotus Live, PowerPoint. Analyzed customer weekly/monthly demand trends for Panasonic service parts, accessories, and tools. Prepared, and entered replenishment reports based on accurate purchasing decisions into SAP system. Performed necessary purchase order update changes including substitutions, pricing, discontinuation, quantity or vendor changes, and ETA updates. Expedited all open orders to ensure on-time delivery. Followed up on late orders. Managed purchases in accordance with air/boat ratio guidelines as directed by Panasonic headquarters to ensure proper inventory levels are maintained. Prevented parts backorders to meet company standards. Reported critical supply issues to vendors, sales, engineering and management in relation to delays impacting customer service. Reported demand spikes to order administration, engineering and vendors for possible quality enhancements. Sourced alternative vendors in order to reduce parts costs and improve delivery. 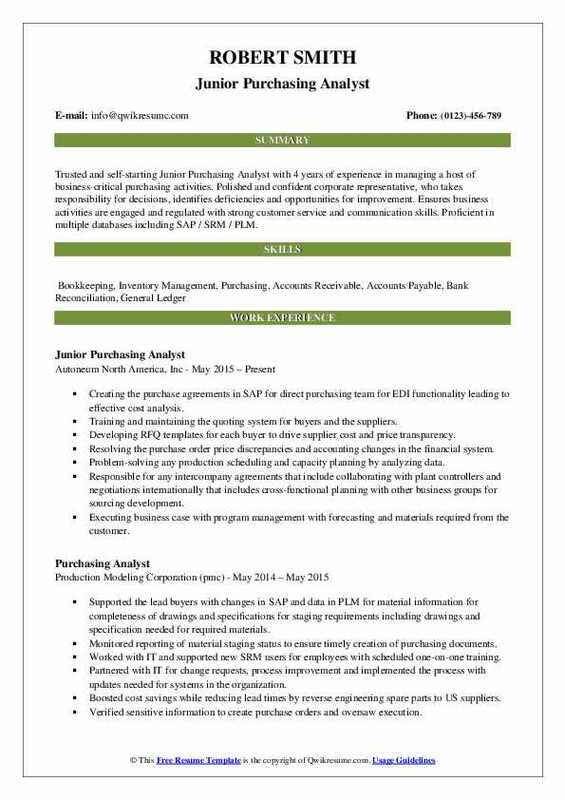 Objective : Experienced IS Purchasing Analyst skilled in the fundamentals of the purchasing process. Proven ability to manage time, develop and oversee budgets, communicate within company departments, suppliers, and executive management to ensure procurement goals are met. Experience with sourcing suppliers, negotiating contracts including a blanket and bulk commodity pricing agreements. Knowledge of American and Japanese working culture. Strong in Microsoft Office Suite and Lotus Notes. Processing the purchase order request from the different department, inputting all the correct account GL codes. Processing invoices ( equipment - hardware and software ) coming from different vendors to carts plus system and sent to accounting for payment processing. Receiving invoices from professional services vendors and creating Docusign approvals for processing and sent to accounting for payments. Reconciling the invoices on the given purchase orders that are current payables and over dues. Coordinating with different Project Coordinators, Project Managers, and Managers on different purchase orders. Budget monitoring on the invoices that are received for allocation on each purchase order given. Monitoring and checking invoices on different projects per purchase order received from the different vendor. Monitoring and checking invoices payments and in-process from SAP for different vendors. Objective : Trusted and self-starting Junior Purchasing Analyst with 4 years of experience in managing a host of business-critical purchasing activities. Polished and confident corporate representative, who takes responsibility for decisions, identifies deficiencies and opportunities for improvement. Ensures business activities are engaged and regulated with strong customer service and communication skills. 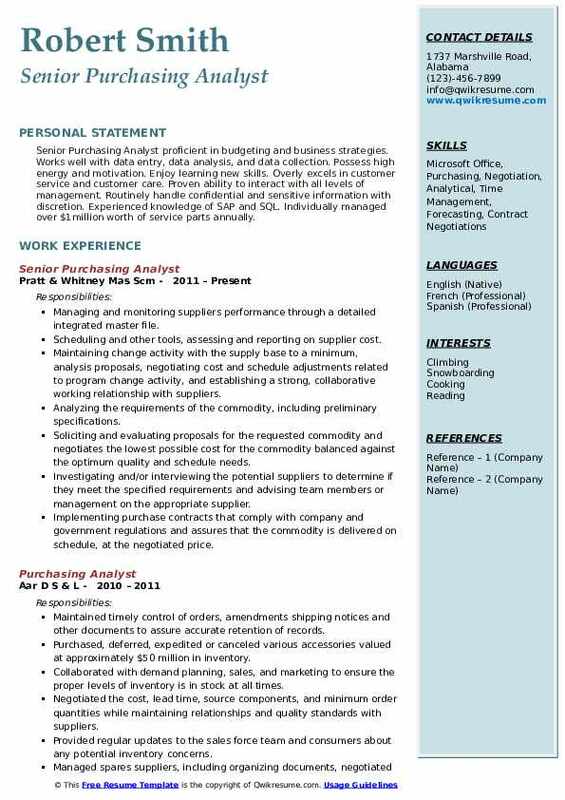 Proficient in multiple databases including SAP / SRM / PLM. Creating the purchase agreements in SAP for direct purchasing team for EDI functionality leading to effective cost analysis. Training and maintaining the quoting system for buyers and the suppliers. Developing RFQ templates for each buyer to drive supplier cost and price transparency. Resolving the purchase order price discrepancies and accounting changes in the financial system. Problem-solving any production scheduling and capacity planning by analyzing data. Responsible for any intercompany agreements that include collaborating with plant controllers and negotiations internationally that includes cross-functional planning with other business groups for sourcing development. Executing business case with program management with forecasting and materials required from the customer. Created savings of 7% with major office supplier for all USA plants and 5% savings with MRO project. 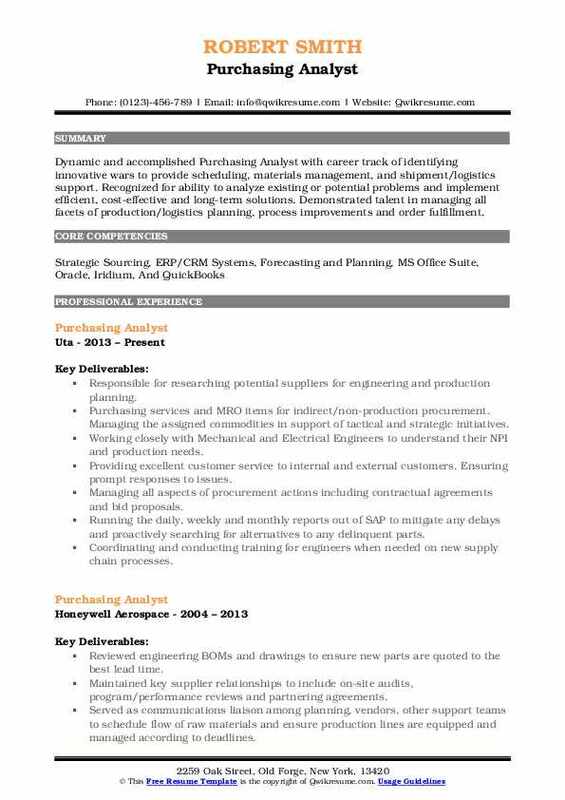 Summary : Conscientious Purchasing Analyst I with over 15 years of procurement experience. Diverse industry background includes medical supplies distribution and food service distribution. Ability to work in the fast-paced and high-volume environment. Strong analytical skills with ability to apply independent judgment. Working knowledge of manufacturing and production as well as contractual, strategic, tactical and leveraged purchasing styles. Responsible for generating accurate sales forecast information to ensure the creation of appropriate. Purchased orders or transmission of appropriate information to the suppliers. Serve as the primary buyer for Medline products to ensure customer support for healthcare companies including Kaiser Permanente. Created and approved purchase orders for respective vendors and ensure orders are transmitted. Responsible for item sales forecasting and making appropriate forecast adjustments as required. Reviewed and modified demand forecasts for inventory items using the JD Edwards system and reporting. Generated recommendations to the Purchasing Manager of customer dedicated additional safety stock. Responsible for managing a defined set of vendor lines managed across all DCS in the region. Managed all vendor lines across the region to include incentive programs, vendor minimums, ordering. Reviewed overselling/underselling SKUs on a weekly basis. Manages the "at risk" SKU process. Running reports on a regular basis, making adjustments to sales forecasts, partnering with the purchasing. 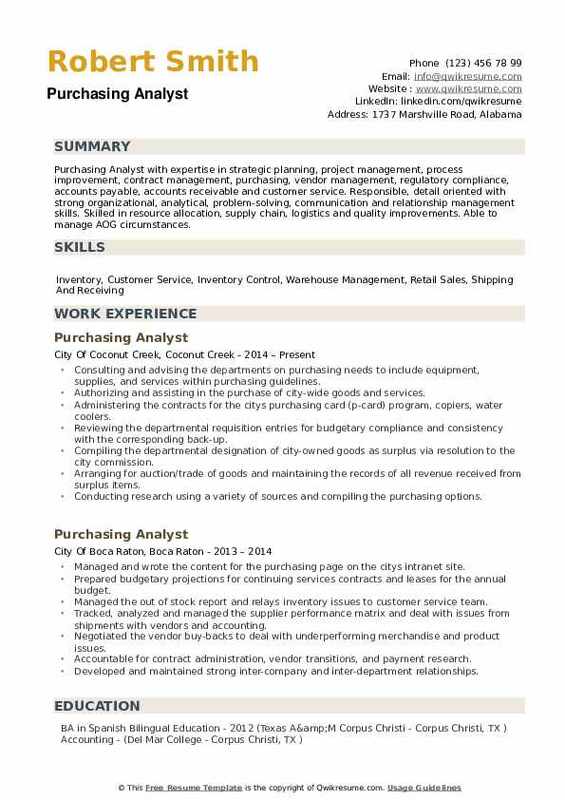 Summary : Senior Purchasing Analyst proficient in budgeting and business strategies. Works well with data entry, data analysis, and data collection. Possess high energy and motivation. Enjoy learning new skills. Overly excels in customer service and customer care. Proven ability to interact with all levels of management. Routinely handle confidential and sensitive information with discretion. Experienced knowledge of SAP and SQL. Individually managed over $1million worth of service parts annually. Managing and monitoring suppliers performance through a detailed integrated master file. Scheduling and other tools, assessing and reporting on supplier cost. Maintaining change activity with the supply base to a minimum, analysis proposals, negotiating cost and schedule adjustments related to program change activity, and establishing a strong, collaborative working relationship with suppliers. Analyzing the requirements of the commodity, including preliminary specifications. Soliciting and evaluating proposals for the requested commodity and negotiates the lowest possible cost for the commodity balanced against the optimum quality and schedule needs. Investigating and/or interviewing the potential suppliers to determine if they meet the specified requirements and advising team members or management on the appropriate supplier. Implementing purchase contracts that comply with company and government regulations and assures that the commodity is delivered on schedule, at the negotiated price. 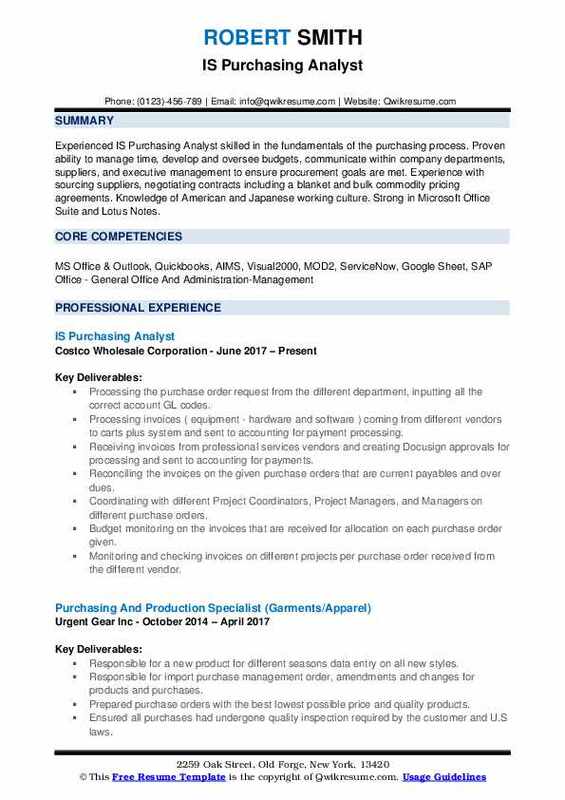 Summary : Purchasing Analyst I proficient in managing forecasting and purchasing needs in the high-volume Omnichannel retail environment. Skilled research and planning abilities as well as strengths in communication and key relationship management. Talented professional well versed in planning and executing daily and special inventory buys. 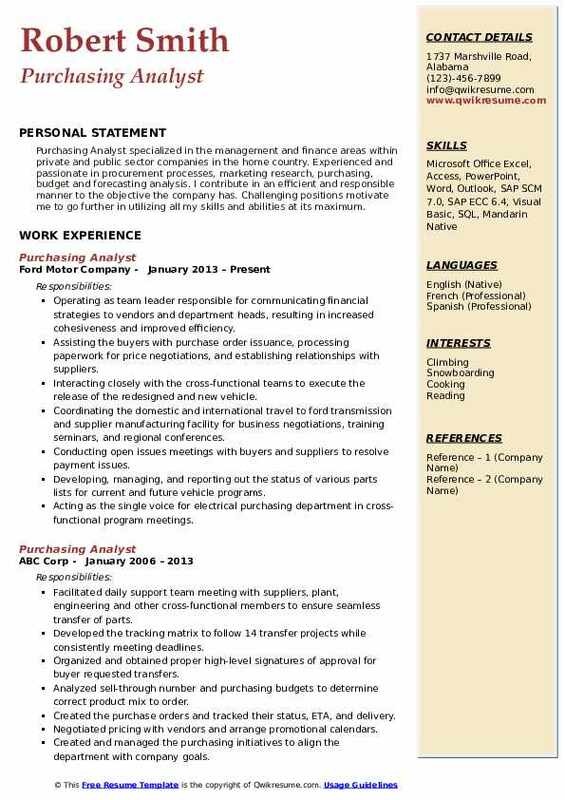 Well educated with a multitude of experience in procurement, contracts, computers, and administrative duties. Managing the stock levels in line with the budgeted amounts via analysis of actual sales vs. Forecast levels to maintain an optimum inventory flow. Generating monthly purchase orders ($2.5m) for 2000+ SKUs and reviewing the overseas shipment releases. Making effective decisions to maintain delivery dates and minimize our of monthly OOS percentages (4%). Communicating and resolving the vendor issues with global product sourcing teams. Performing monthly forecast analysis on 2000+ SKUs to identify demand tracking exceptions and adjust to proper forecast models. Creating new BOMs in the database and maintaining 500+ manufactured items (standard costs, usage percent). Working with the domestic vendors to purchase raw materials, assist with sourcing new vendors, and prices. Responding on a daily basis to international and domestic vendor changes for open purchase orders. Creating job orders for weekly molding schedules and facilitating review meetings with factory management. Summary : An organized and thorough Purchasing Analyst IV with a proven record of success in procuring quality materials at the best possible cost that are delivered on time. A resourceful professional who thrives on researching and identifying reliable suppliers that save money while maintaining quality. Goes the extra mile. Excellent multi-tasking skills. 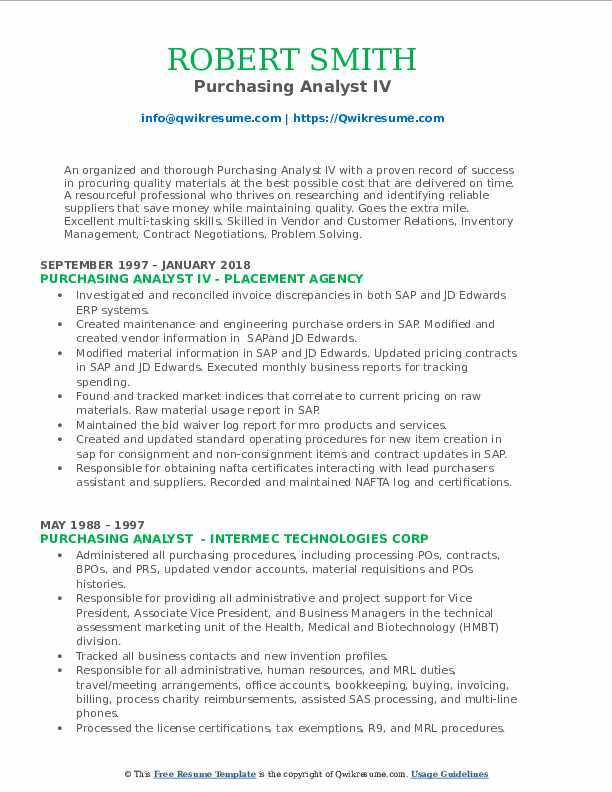 Skilled in Vendor and Customer Relations, Inventory Management, Contract Negotiations, Problem Solving. Investigated and reconciled invoice discrepancies in both SAP and JD Edwards ERP systems. Created maintenance and engineering purchase orders in SAP. Modified and created vendor information in SAPand JD Edwards. Modified material information in SAP and JD Edwards. Updated pricing contracts in SAP and JD Edwards. Executed monthly business reports for tracking spending. Found and tracked market indices that correlate to current pricing on raw materials. Raw material usage report in SAP. Maintained the bid waiver log report for mro products and services. Created and updated standard operating procedures for new item creation in sap for consignment and non-consignment items and contract updates in SAP. Responsible for obtaining nafta certificates interacting with lead purchasers assistant and suppliers. Recorded and maintained NAFTA log and certifications. Assisted in obtaining toller information when a material with a mix of client supplied raw materials and toller supplied raw materials. Summary : Dynamic and accomplished Purchasing Analyst with career track of identifying innovative wars to provide scheduling, materials management, and shipment/logistics support. Recognized for ability to analyze existing or potential problems and implement efficient, cost-effective and long-term solutions. Demonstrated talent in managing all facets of production/logistics planning, process improvements and order fulfillment. Responsible for researching potential suppliers for engineering and production planning. Purchasing services and MRO items for indirect/non-production procurement. Managing the assigned commodities in support of tactical and strategic initiatives. Working closely with Mechanical and Electrical Engineers to understand their NPI and production needs. Providing excellent customer service to internal and external customers. Ensuring prompt responses to issues. Managing all aspects of procurement actions including contractual agreements and bid proposals. Running the daily, weekly and monthly reports out of SAP to mitigate any delays and proactively searching for alternatives to any delinquent parts. Coordinating and conducting training for engineers when needed on new supply chain processes. Managing and entering all material master for new and updated BOMs created by engineering. Working with quality to investigate drawing deviations, product reliability, and issue reports. Summary : Purchasing Analyst specialized in the management and finance areas within private and public sector companies in the home country. Experienced and passionate in procurement processes, marketing research, purchasing, budget and forecasting analysis. I contribute in an efficient and responsible manner to the objective the company has. Challenging positions motivate me to go further in utilizing all my skills and abilities at its maximum. Operating as team leader responsible for communicating financial strategies to vendors and department heads, resulting in increased cohesiveness and improved efficiency. Assisting the buyers with purchase order issuance, processing paperwork for price negotiations, and establishing relationships with suppliers. Interacting closely with the cross-functional teams to execute the release of the redesigned and new vehicle. Coordinating the domestic and international travel to ford transmission and supplier manufacturing facility for business negotiations, training seminars, and regional conferences. Conducting open issues meetings with buyers and suppliers to resolve payment issues. Developing, managing, and reporting out the status of various parts lists for current and future vehicle programs. Acting as the single voice for electrical purchasing department in cross-functional program meetings. Analyzing the data and preparing the effective report out methods for management and team meetings regarding current and future vehicle programs. Partnering with buyers and resource team to transfer multi-million dollar commodities to new ford qualified suppliers according to the buyer's strategy. Headline : Purchasing Analyst with expertise in strategic planning, project management, process improvement, contract management, purchasing, vendor management, regulatory compliance, accounts payable, accounts receivable and customer service. Responsible, detail oriented with strong organizational, analytical, problem-solving, communication and relationship management skills. Skilled in resource allocation, supply chain, logistics and quality improvements. Able to manage AOG circumstances. Consulting and advising the departments on purchasing needs to include equipment, supplies, and services within purchasing guidelines. Authorizing and assisting in the purchase of city-wide goods and services. Administering the contracts for the city's purchasing card (p-card) program, copiers, water coolers. Reviewing the departmental requisition entries for budgetary compliance and consistency with the corresponding back-up. Compiling the departmental designation of city-owned goods as surplus via resolution to the city commission. Arranging for auction/trade of goods and maintaining the records of all revenue received from surplus items. Conducting research using a variety of sources and compiling the purchasing options. Ensuring the city and vendor compliance with cooperative/piggyback contracts. Meeting with vendors to obtain the latest product information, trends, and pricing.